With hoards of people flocking to SXSW this month, I thought I’d post one of my first donut hunting expeditions from back in 2011: Gordough’s. Situated in a beautiful Airstream trailer in a food truck gathering area, this place is a must-stop when in Austin. Food trucks are huge in this town, so it’s only natural that the city’s best donut would be housed in a food truck. These donuts are a little pricier than you may find elsewhere, but these are more of a meal than a snack, hence their slogan: “Big. Fat. Donuts.” Don’t be embarrassed if you need a plastic fork and knife to pound down this tasty treat. Each donut is fried fresh to order so perhaps you should skip the next SXSW panel or meet your friend a little later on 6th St. And upon perusing the menu, each donut description is more heavenly than the next. It’s like every sweet treat or baked good you love has setup shop on top of a donut and is now being sold at Gordough’s. I couldn’t try a plain glazed donut here, because they don’t really have one on the menu. 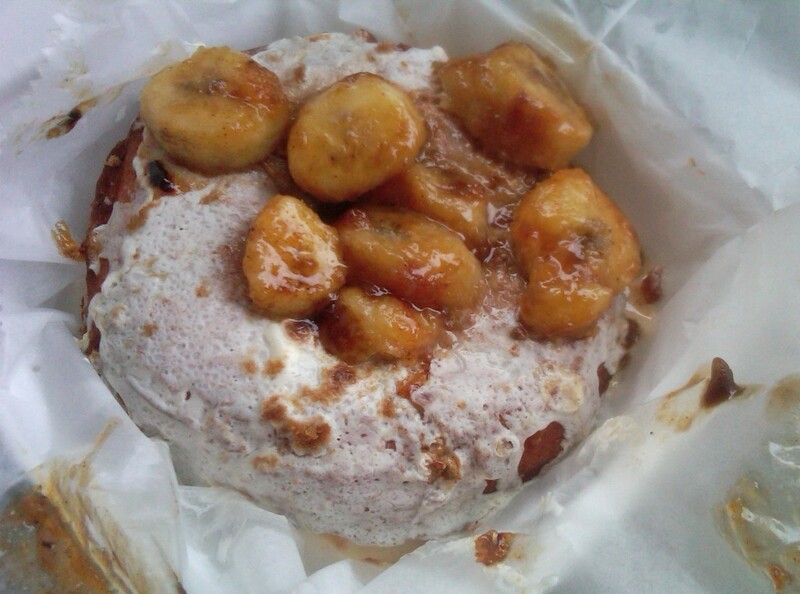 So I started out with the Funky Monkey, which is a large yeast donut topped with cream cheese icing, grilled bananas, and brown sugar. It was a decadent bananas-foster-like treat. The Cherry Bombs donut was next on my list and featured a group of cherry topped donut holes welded together by glaze and then topped with cinnamon, sugar, and cake mix. Indulgent, satisfying, and probably took a few months off my life. If you want something more savory (or perhaps in place of you dinner) they have donuts like the Boss Hog, the Flying Pig, and their famous Mother Clucker, which is topped with a fried chicken strip and honey butter.